With a stunning new collection of furniture, Livinglass highlight the amazing beauty of their inventive laminated architectural glass. 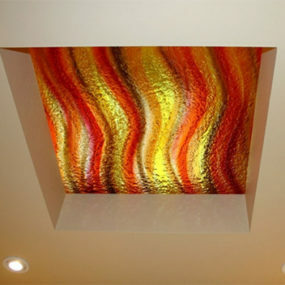 Livinglass have developed a new and innovative process to create dramatic laminated glass panels with a multitude of uses. 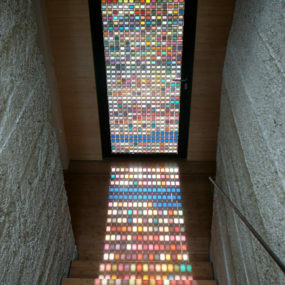 The new process allows any object or material to be captured in glass up to an inch thick. Livinglass have a magical product, which can capture leaves, flowers, sculptured materials, even jelly beans and permanently preserve their beauty in transparent glass. For designers this opens whole new worlds of opportunity. 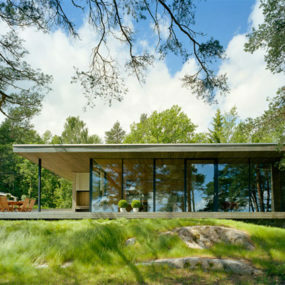 Suddenly rich textures and lush plants can be included in environments where previously they were difficult to maintain. Although we’ve seen similar in resin or acrylic, Livinglass creates a high quality glass laminate which will not discolour, cloud, craze, distort or delaminate like its competitors. Livinglass laminated glass even qualifies as impact resistant safety glass, provides UV protection, can be used in wet environments with no extra modifications, it’s easy to clean and is installed like normal glass. Livinglass have put together a diverse collection of gorgeous designer patterns that will add wonder and beauty to any application. 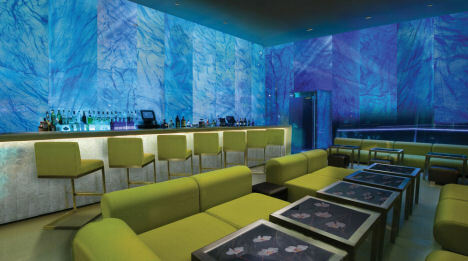 From rich red flowers with bamboo, to broken glass, stones, and sculpted wood there is literally a design for everyone. 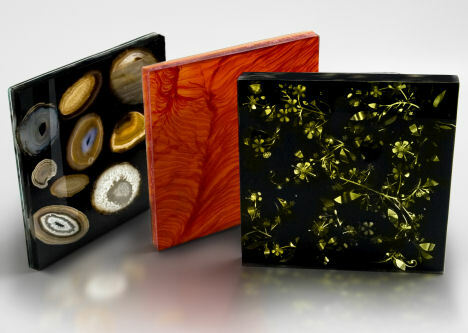 Now taking their work a step further, Livinglass have released a line of products using their gorgeous glass. 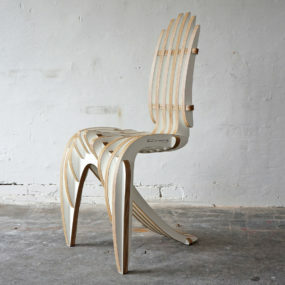 First off is a fantastic selection of furniture. The new tables use wood to contrast with the smooth glass centrepiece. There is a wonderful tension created between the organic flowers and textures captured in cold smooth glass, and the warm organic wood. The resulting table is chic and sophisticated. 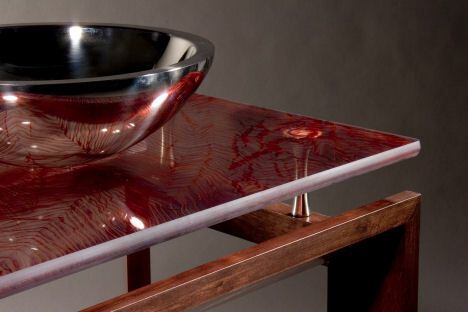 Livinglass’ new bathroom vanity takes advantage of the transparency in the red kimono pattern. The vanity surface is suspended above the unique geometric legs, while the basin reflects the intriguing glass pattern. 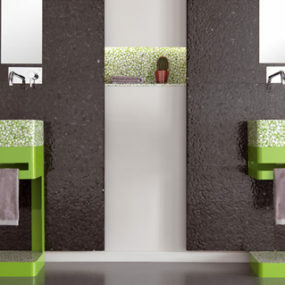 The glass is the centrepiece in a vanity which focuses on its distinctive properties. 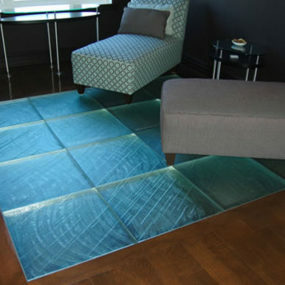 Finally Livinglass have created a line of glass flooring. 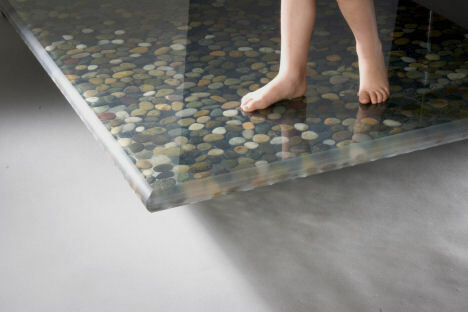 Strong, impact resistant, and ADA compliant slip resistance glass makes a distinctive and practical flooring. 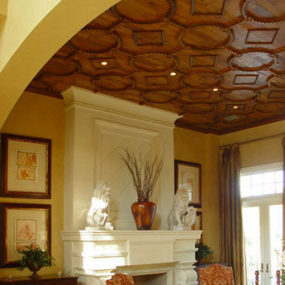 Available in a number of patterns and finishes there is an unlimited number of ways to creatively enhance any home. Livinglass is a dynamic trendy material that opens a world of possibilities; with the new Livinglass laminated glass furniture they’ve opened that to a world of applications where the only limit is one’s imagination. 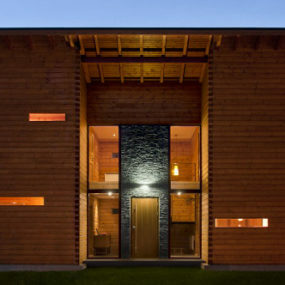 Laminated Pinewood House by Nordicasa Design & Construction. We love it! PSC sinks and bathtubs – the amazing products!